[SatNews] the devices' built-in fuse guarantees protection at 5 A for 10 ms and is optimized to ensure activation while avoiding false triggering. Vishay Intertechnology, Inc. (NYSE: VSH) today introduced a new Hi-Rel series of TANTAMOUNT® surface-mount solid tantalum molded chip capacitors for military and aerospace applications. Available with high-reliability screening and surge current testing options in accordance with MIL-PRF-55365, the Vishay Sprague T42 series combines a built-in fuse for fail-safe operation with high capacitance and voltage ratings and low ESR down to 80 mΩ at +25 °C and 100 kHz. The capacitors released today are ideal for filtering, decoupling, and energy storage applications in weapons and radar systems, avionics, and space-based electronics. To protect against catastrophic failures in these safety-critical applications, the devices' built-in fuse guarantees protection at 5 A for 10 ms and is optimized to ensure activation while avoiding false triggering. The T42 employs a multi-anode "mirror" structure that reduces ESR by at least 50 percent. Each internal anode within the device has a dedicated fuse, allowing unaffected anodes to maintain capacitance in the unlikely event of a failure. Depending on the application, this fault-tolerant design allows for a degraded mode of operation rather than a complete loss of functionality. 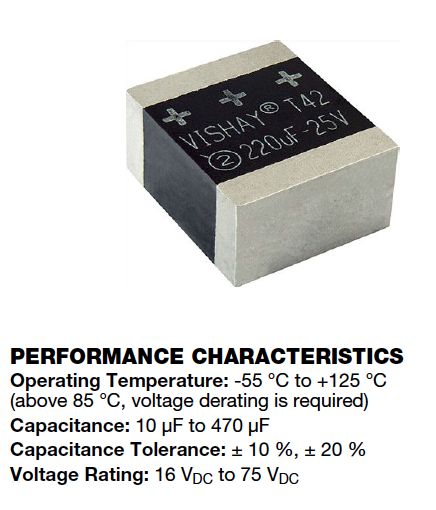 Offered in the M2 case code, T42 series capacitors utilize Vishay's patented leadframeless multi-array packaging (MAP) technology for increased volumetric efficiency. Built on a glass-reinforced resin base, the device eliminates the problematic J-lead construction and associated current-loops, thereby reducing ESL by two thirds that of traditional capacitors. The result is high capacitance from 10 μF to 470 μF, with tolerances of ± 10 percent and ± 20 percent, and voltage ratings from 16 VDC to 75 VDC. 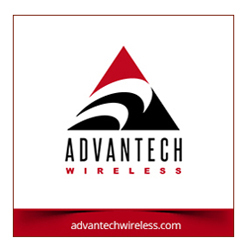 With higher capacitance than traditional devices, the capacitors reduce the overall component count and simplify designs. The T42 series offers an operating temperature range of -55 °C to +85 °C, +125 °C with voltage derating, and maximum ripple current from 0.7 A to 1.8 A. RoHS-compliant, the devices are available with 100 percent tin or tin/lead terminations. Vishay Intertechnology, Inc., a Fortune 1000 Company listed on the NYSE (VSH), manufactur discrete semiconductors (diodes, MOSFETs, and infrared optoelectronics) and passive electronic components (resistors, inductors, and capacitors). These components are used in virtually all types of electronic devices and equipment, in the industrial, computing, automotive, consumer, telecommunications, military, aerospace, power supplies, and medical.Vishay can be found on the Internet at.